Candidates, Caucuses, Political Parties And Nonprofits Are Spending Millions Of Dollars On TV Ads To Influence Who Controls The State House And Senate. 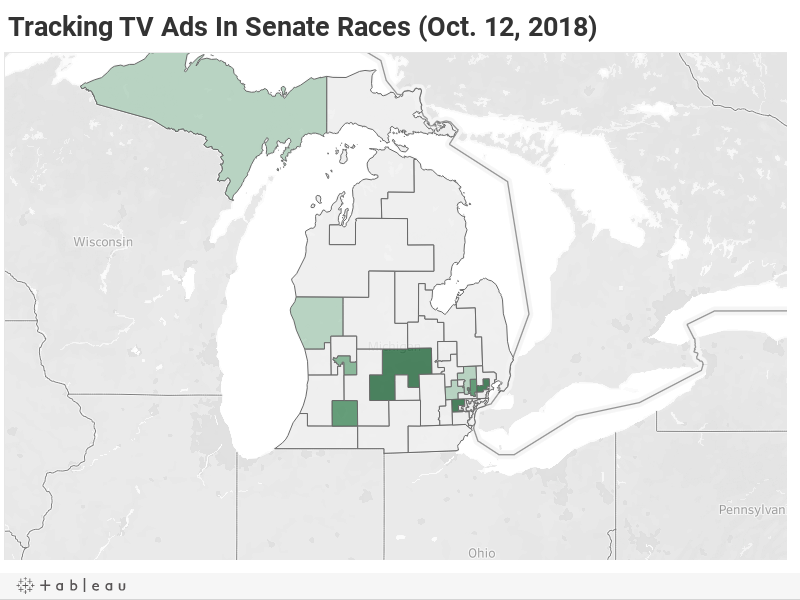 LANSING (OCT. 12, 2018) — With three weeks remaining until Election Day, an estimated $4.3 million in TV ads have already aired in races for the Michigan Legislature. The majority of the money, about $2.4 million, has gone to ads about candidates running in just four counties in Southeast Michigan. As Democrats push to make gains in suburban areas nationally, consultants believe the area outside of Detroit could be a key battlefield in the fight for control of the state House and state Senate this year. The ad-spending numbers back that idea up as campaigns and outside groups try to sway voters in swing districts. Of the five state Senate races that have attracted the most ads so far, three are in Southeast Michigan. Of the five state House races that have attracted the most ads so far, four are in Southeast Michigan. Adrian Hemond, a Democrat and CEO of the consulting firm Grassroots Midwest, said while it’s normal for a lot of money to be spent in Southeast Michigan, he wouldn’t be surprised if the spending total has gone up in 2018 compared to past elections. That’s even with inflation factored in, he said. “That’s definitely where a lot of the playing field is in terms of majority control,” Hemond said. Jeff Timmer, a Republican consultant and managing partner of Two Rivers Public Affairs, said the ad dollars are somewhat reflective of the distribution of votes. The Detroit market typically accounts for about half of the state’s votes, he said. “But there can be no doubt that long-time GOP legislative strongholds across much of Oakland and western Wayne counties are in play this year unlike prior cycles,” Timmer added. The Livonia-area 19th House District in Wayne County has not attracted much attention in past years. However, the House Democratic Fund, the House Republican Campaign Committee and the Michigan Democratic State Central Committee are all airing ads there this fall, according to public disclosures. On Nov. 6, Michigan voters will decide how to fill the 19th District seat and the other 147 seats in the Legislature. Currently, Republicans have majorities in both the Senate and the House. In the Senate, they hold 27 of the 38 seats. In the House, they hold 63 of the 110 seats. The fight for future control of the chambers is playing out on TV screens across Michigan and will intensify as Election Day nears. The Michigan Campaign Finance Network has tracked an estimated $4.3 million in general election ads about candidates for the Legislature. To track the spending, MCFN analyzed data on broadcast TV ads from Kantar Media/CMAG that covered through Monday, Oct. 8, and examined hundreds of public disclosures on cable and broadcast ad purchases that covered, in some cases, through Oct. 14. The cable and broadcast disclosures filed with the Federal Communications Commission (FCC) may not be conclusive because it’s up to TV stations and cable providers to ensure the filings are timely and accurate. And the public filings are not always up to date or 100-percent accurate. In addition, the analysis included only ad purchases that could be tied to specific legislative races. Some of the ad disclosures didn’t include any information about the subject of the ads so the ads couldn't be tied to races. Below are maps showing the Senate and House districts attracting the most TV ads so far, according to the analysis, and information on where some of money is coming from. MCFN will work to update these maps throughout the rest of the year. — The MCFN analysis tracked an estimated $2.9 million in TV ads so far this fall in state Senate races. Republicans have an advantage in advertising: Of the $2.9 million, ads amounting to about $1.9 million have either promoted GOP candidates or criticized Democratic candidates. 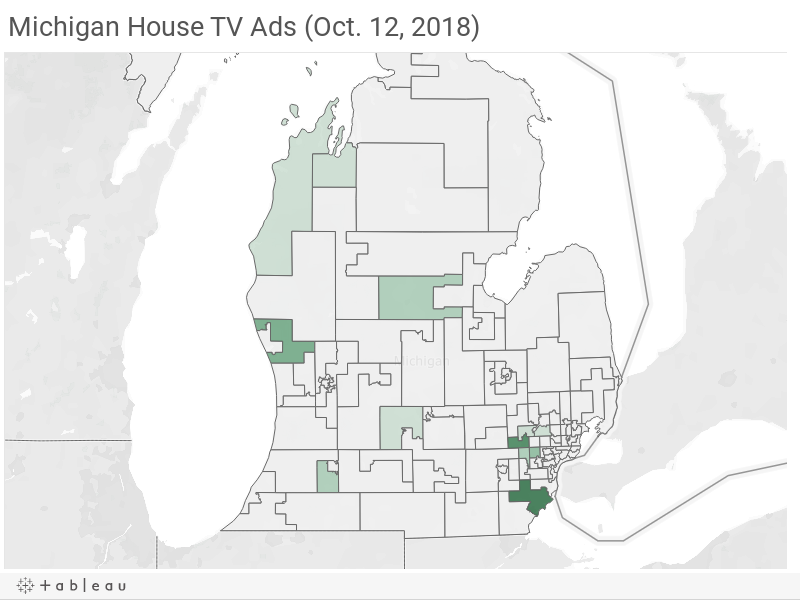 — The district that has seen the most ads so far, according to the analysis, is the Macomb County-based 10th District, which is currently held by a term-limited Republican. There, Rep. Henry Yanez, a Democrat from Sterling Heights, is running against Michael MacDonald, a GOP political newcomer from Macomb Township. — One of the biggest funders of Republican campaigns for the Senate is the Senate Republican Campaign Committee. Its biggest donors since the last Senate election have been members of the DeVos family ($361,000), Senate Majority Leader Arlan Meekhof’s Moving Michigan Forward PACs ($280,000), the Blue Cross Blue Shield PAC ($155,000) and the Michigan Association of Realtors’ Realtors PAC ($150,500). — One of the biggest funders of Democratic campaigns for the Senate is the Senate Democratic Fund. Its biggest donors since the last Senate election have been PACs connected to Senate Minority Leader Jim Ananich ($320,000), the United Auto Workers PAC ($170,000), the International Brotherhood of Electrical Workers ($136,000) and the Michigan Education Association PAC ($120,000). 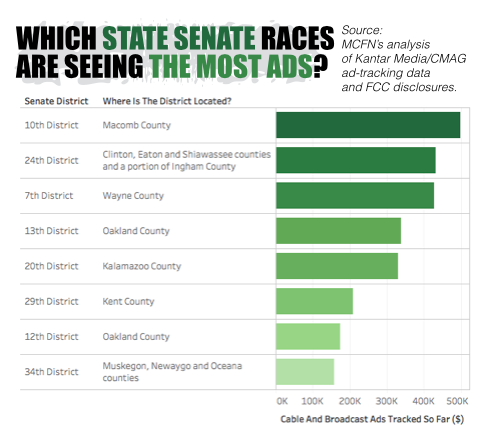 — Outside of the candidates’ campaigns, the caucus committees and the state parties, the biggest spender on Senate ads has been the nonprofit Michigan Citizens for Fiscal Responsibility, which has been airing ads that could benefit Republican Senate candidates across six races. According to contracts on file with the FCC, the nonprofit, which doesn’t have to disclose its donors, is sponsoring an estimated $569,000 in ads so far. — The MCFN analysis tracked an estimated $1.4 million in TV ads so far this fall in state House races. Republicans have an advantage in ads. Of the total, ads costing an estimated $878,000 have either promoted GOP candidates or criticized Democratic candidates. — The district that seen the most ads so far, according to the analysis is the Monroe County-based 17th District. There, Rep. Joe Bellino, a Republican from Monroe, is running against Democrat Michelle LaVoy, Monroe’s clerk-treasurer. The race has attracted an estimated $279,000 in ads so far. The Michigan Democratic State Central Committee has reserved $102,000 in ad time in the race, according to filings currently available from the FCC. — Of the 110 House seats, MCFN has tracked general-election advertisements in races for 19 of the them. — One of the biggest funders of Republican campaigns for the House is the House Republican Campaign Committee. Its biggest donors since the last House election have been members of the DeVos family ($240,000), PACs connected to House Speaker Tom Leonard ($160,000), members of the Kennedy family, who run Autocam ($160,000) and members of the Secchia family ($120,000). — One of the biggest funders of Democratic campaigns for the House is the House Democratic Fund. Its biggest donors since the last House election have been PACs connected to House Minority Leader Sam Singh ($160,000), United Auto Workers Michigan PAC ($80,000), the Michigan Education Association ($80,000) and the Michigan Regional Council of Carpenters ($80,000).